It’s fine. Everything is fine :) That’s been my mantra and my response to everything these last few weeks. Throw as many wrenches as you can, it’s totally fine. Usually when I get stressed out, you can tell by my outfits and my eating habits. Outfits tend to consist of battered tees and old jeans on repeat, and my eating habits become non-existent. I am a stress non-eater, if you will. The best way I embrace the crap that life brings is pushing myself to dress up a bit even when I’m not required to. If I look good, I feel good and the stress doesn’t feel as stress-y. That’s why I decided to pair some trousers with the tee (again). Easy, right? I’m definitely on a trousers kick, but this time I’m trying a color combo of olive and millennial (or Pepto Bismol) pink. 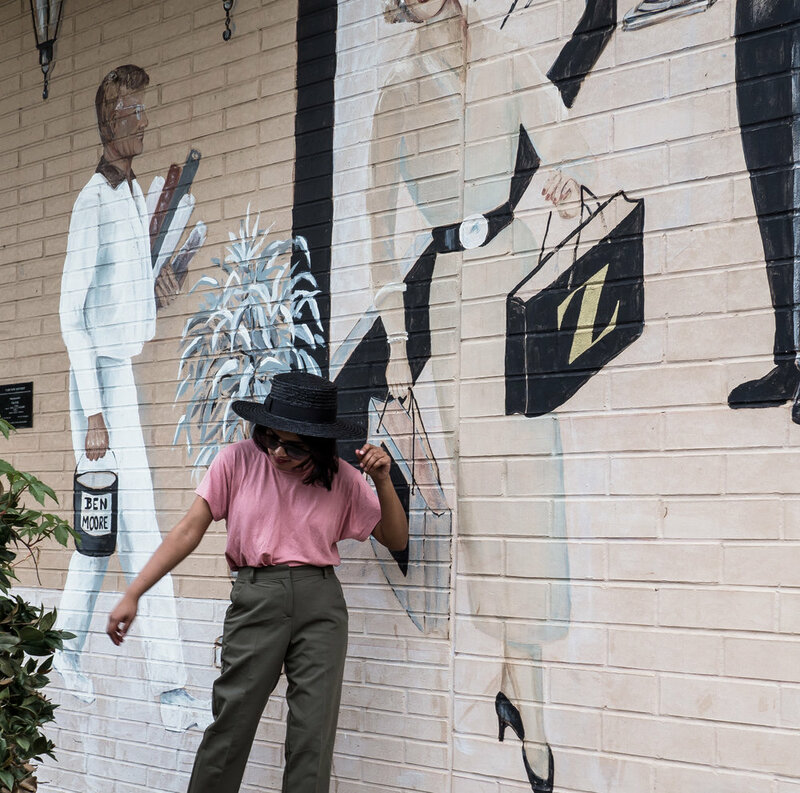 When you don’t actually have to wear trousers for work, they seem a lot more fun to style, which is why I’m not suited up for profession, but for a casual stroll through downtown Cary, North Carolina. There’s a pretty complex mural here that gives me Havana vibes, and my outfit says I’m here for it. 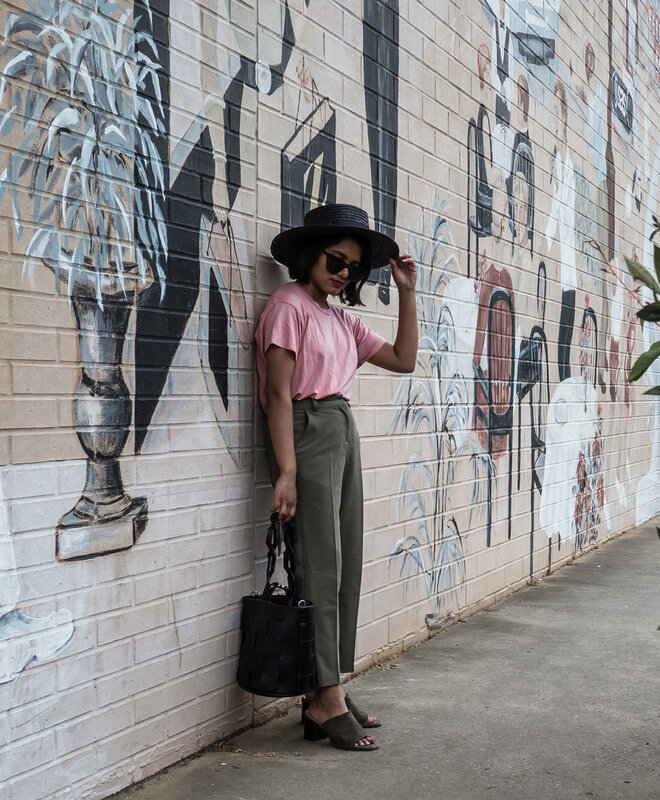 I actually only bought these Asos petite olive trousers because of the ankle length; they kinda hit perfectly without any tailoring. I also love how the muted tone matches my olive mules. This Reformation pink tee is one of my favorites, despite the color, because it’s made out of tencel. Adding my favorite black boater hat, I feel and look like a tulip going on a work vacation. Work vacation is essentially a trip you take for work, but the amount of fun and relaxation you have on it equivocates to vacation. Speaking of work vacations, it’s that time of year where I get sucked into organizing our annual summit, which pairs with Hopscotch, Raleigh’s biggest music festival. If you didn’t know, blogging is not my full-time gig. There’s an actual 9-5 job, which gets hectic in early September. But hey, you’re telling me my job for three days is to entertain people and see shows? I can live with that. It’s been a tumultuous couple of weeks of work, more work, and some fun. Now that hurricane Florence is literally raining on my parade right now, I figured I’d write something up. I’m currently trying to figure out where I’m headed next - blog wise, travel wise, career wise, and home wise. We’ll see where the rest of 2018 takes me.